← Scoping Out the Future Flatlands Coffee. 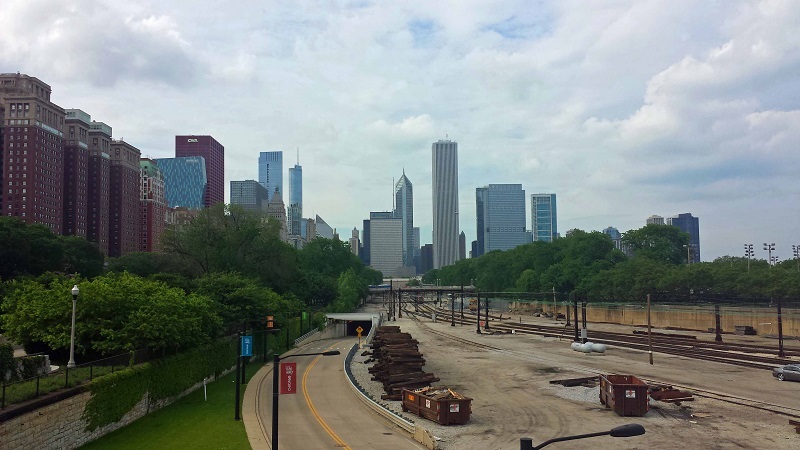 Chicago: A Grant Park Skyline Walk. When in the big city, I’m always looking for that next skyline shot. Chicago is no exception. 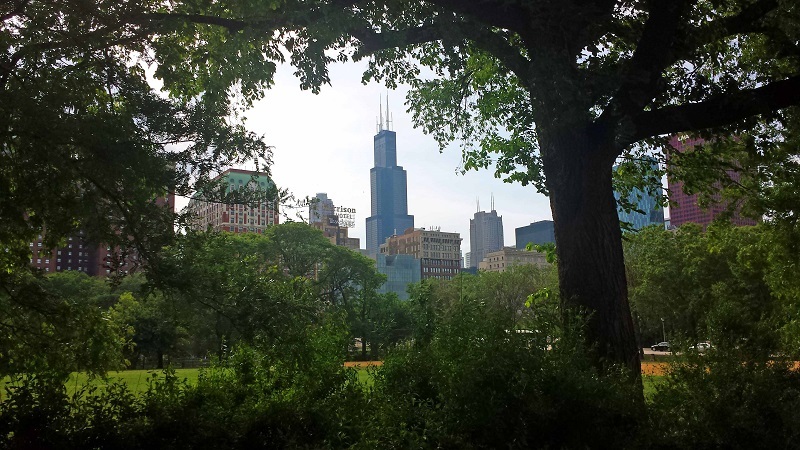 One my favorite places to go for a walk and capture the Windy City is from Grant Park. On my most recent walk through the park I hopped off Michigan Avenue onto E. Balboa Avenue. 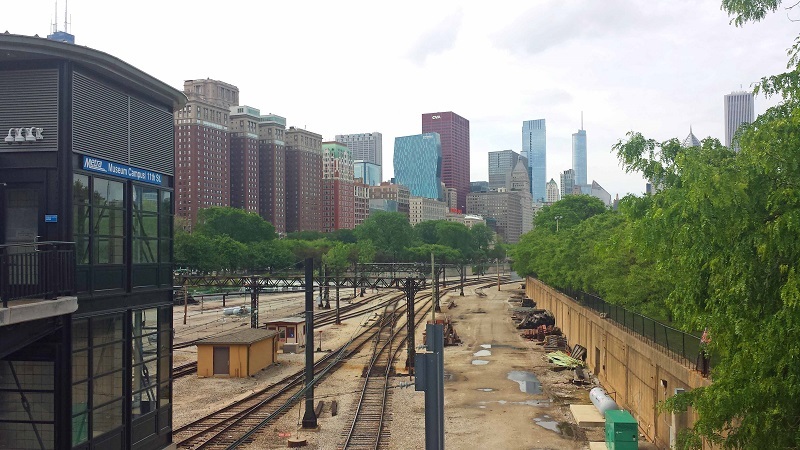 The skyline was already in plain site as I walked over the train tracks coming and going from Chicago Union Station. After crossing the bridge I turned and headed north on S. Columbus Drive. 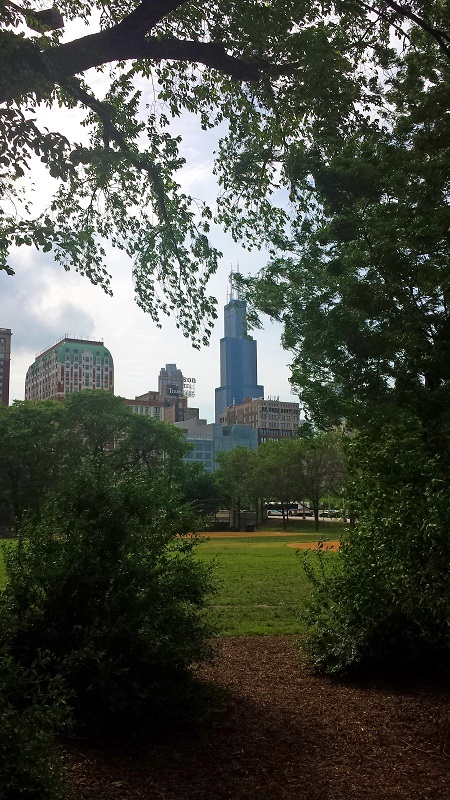 I started playing peekaboo with Willis Tower, as it was coming in-and-out of view along with the rest of the skyline from behind the trees. Nothing like seeing a baseball field in summer right in the heart of a city. The taller trees soon became shorter opening things up. There you are Chicago. It was a cold winter and Spring in the Midwestern United States, but everything is green, in full bloom and beautiful now. Love and marriage, love and marriage. Go together like a horse and carriage. Walking further along S. Columbus Drive. 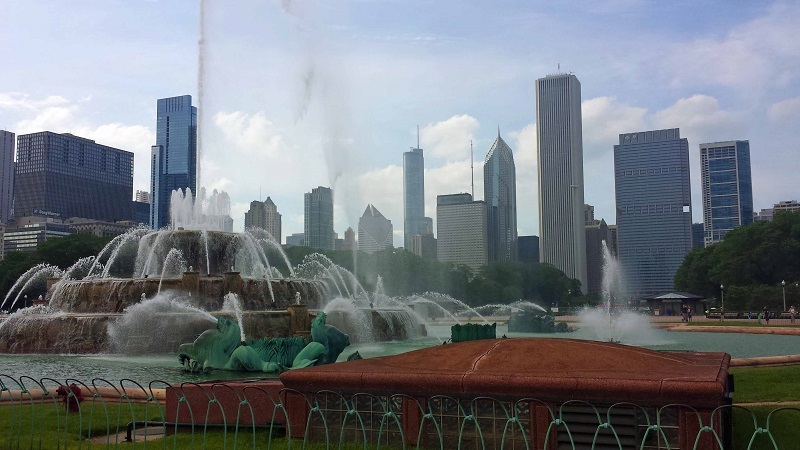 you’ll come up to Buckingham Fountain on your right (at E. Congress Parkway) which many will recognize from the title sequence of the television series Married with Children. 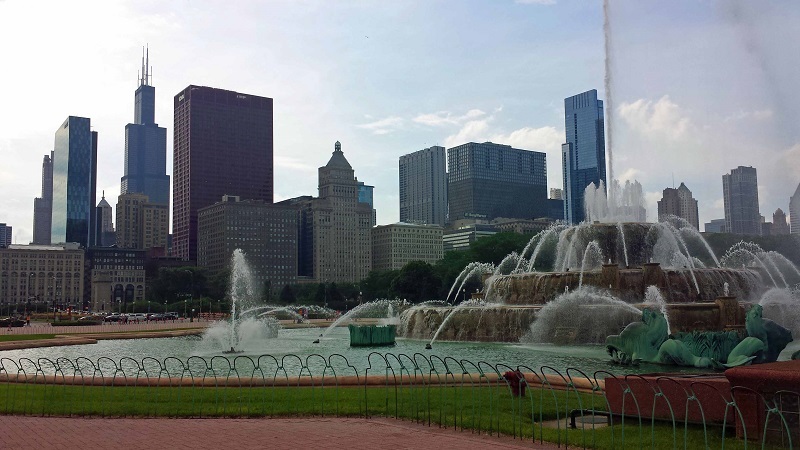 The fountain marks the center of Grant Park and is one of the largest you’ll find anywhere, providing wide open panoramic skyline views. 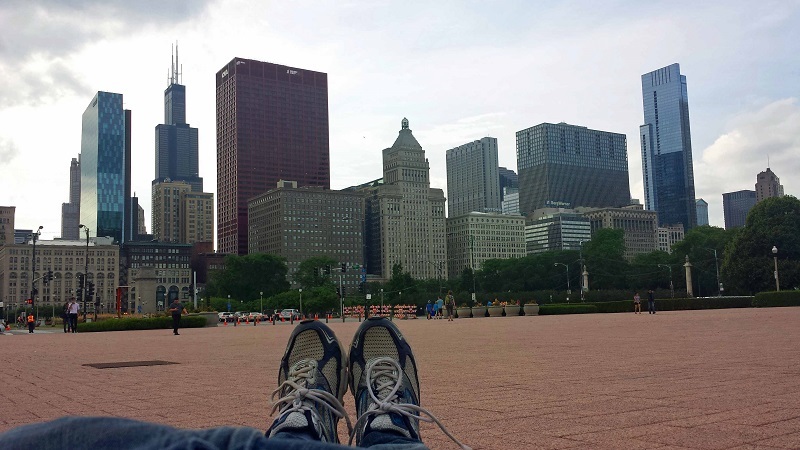 It’s time to lay down on the brick walkway, relax and soak in all the tall buildings. 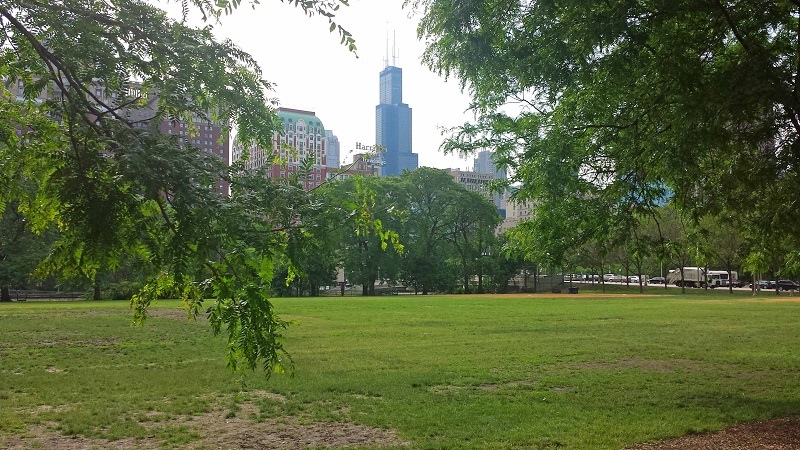 I went back to the peekaboo continuing north past Butler Field until I reached E. Monroe Street and Millennium Park. 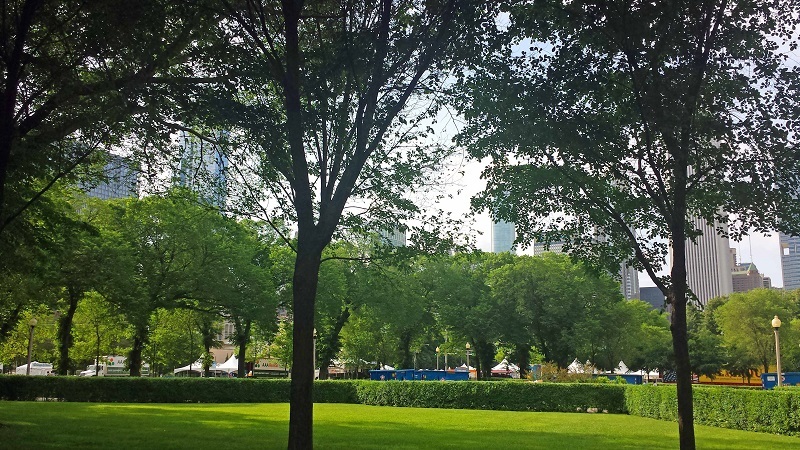 It was a short, but nice summer day stroll through Grant Park checking out the high-rises of Chi-town. 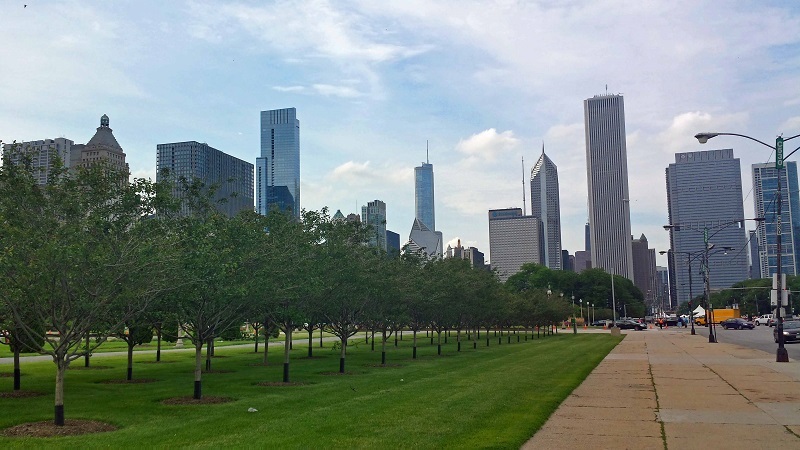 Checkout my previous post, Chicago: The Agora Sculptures of Grant Park, for more Chicago skyline walking fun within Grant Park. You’ll see some pretty cool and interesting sculptures too. 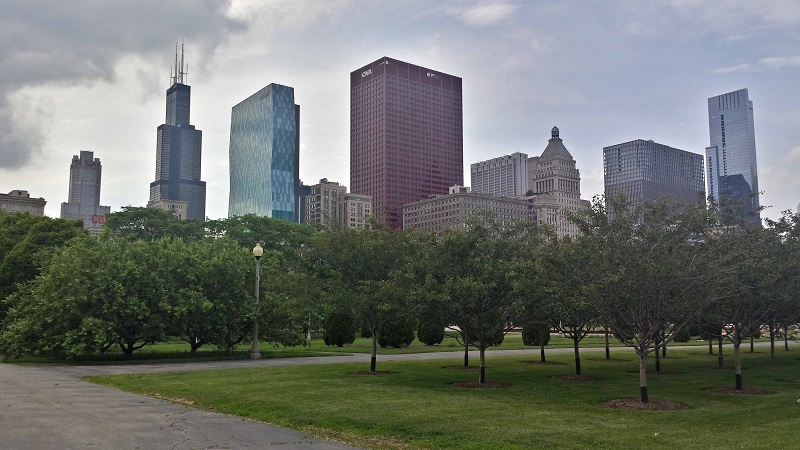 What city parks have you walked in in your travels or around home that provide great skyline views? 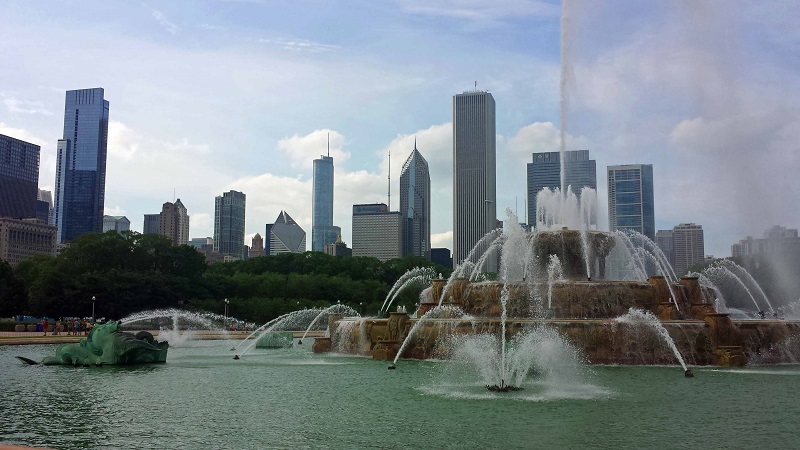 This entry was posted in Chicago, travel and tagged Buckingham Fountain, Chicago, city park, fountain, Grant Park, skyline, Windy City. Bookmark the permalink. When it comes to architecture, Chicago has the most beautiful skyline in the US in my opinion. I sometimes have to pinch myself that I get to see all that whenever I want. 🙂 You found some great spots for pics. Glad you enjoyed yourself in Chi! I was just admiring the skyline yesterday while canoeing up the Chicago River from the south. Great way to see the city.